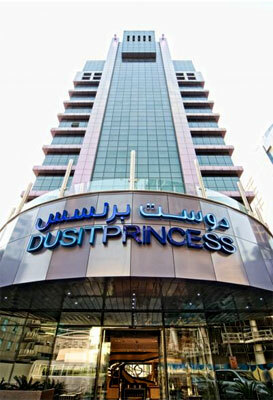 Dusit Princess City Centre Hotel Dubai - Dubai Hotel Located in Dubai City Centre, Dubai Shopping Area and Dubai Business District! Dusit Princess City Centre offers 120 superbly equipped rooms make for first-class accommodation with the fascinating allure of contemporary Thai décor. Relax in casual elegance, and comfort ambience. Hotel's meeting rooms, on the mezzanine floor, is ideal for small to medium-size meeting and seminars. Both meeting rooms have windows along one side to let in natural light. Excellent recreational and business facilities, including a Business Centre supported with full secretarial services and broadband connectivity as well as a Fitness Centre that is equipped with state-of-the-art exercise equipment. The rooftop swimming pool and Jacuzzi are the ideal places to relax and unwind with the advantage of having a 360 degree stunning views of the surrounding area. For further relaxation, a Fitness Centre set in a thoroughly relaxing atmosphere is available for reflexology therapy treatments. Diverse arrays of dining options are also readily available. These includes the JoyBean Café for light snacks and refreshments, an al fresco Shisha Zone for those seeking to experience the centuries-old tradition of the Shisha pipe with flavoured tobacco. Guests can make use of the state-of-the-art fitness centre and large outdoor pool. Dusit Princess City Centre is also just minutes away from Dubai International Airport, Sheikh Zayed Road, Expo Centre and Emirate of Sharjah.